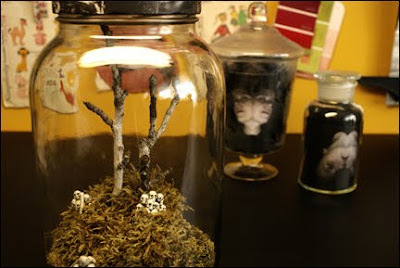 Just in time for Halloween- why not put together a little creepy jar of horrors for Halloween! One is a faux terrarium and the other is a "conjoined twin" specimen in a bottle. Check out this fun how-to at poopscape(lol). I have never heard the term of "wunderkammer" in regards to a cabinet o' curiosities but I'm loving the vibe of these bottled horrors. When I was little I took a painting class at a community college biology room CHOCK FULL of animals in jars. I will never forget the 22" or LARGER horse FETUS in a jar. It looked like a sleeping colt and it had long eyelashes. The fact that it looked so peaceful was unnerving. Maybe if it had been a conjoined-twin horse fetus I wouldn't have been so creeped out by it.